My buddy Dustin Stockton at Western Representation PAC came up with a great idea to increase the amount of conservative grassroots activism over the summer break when members of Congress are back in their districts hearing from their constituents. Here’s what he’s doing. 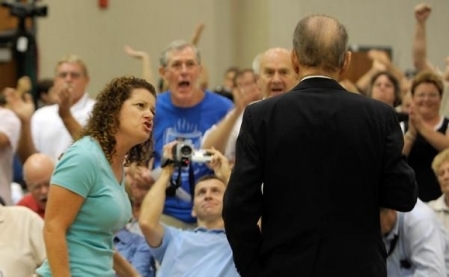 The picture above is of the iconic moment Tea Party activist Katie Abram brought the Arlen Specter political machine to its knees. There are so many questions that need to be asked about NSA, Prism, Egypt, Syria, Obamacare, Benghazi, extortion 17, gun control, federal reserve policy, unemployment, municipal bankruptcies, and probably hundred other things that currently escape me. Now is the time for WE THE PEOPLE to ask those questions! The stakes are higher than they’ve ever been and anyone with any sense can see how precarious our situation is. It’s time for people from around the country to go out and start asking questions of their elected officials and when one of us shows up with a well researched and pertinent question that effort should be rewarded! More than 90% of every dollar raised for this campaign will be distributed to people who submit videos of an exchange between themselves and a member of congress in a contest format. Depending on how much money we raise we will offer ‘prizes’ for videos that reach certain thresholds or perform the best amongst submissions. The prizes and winners will be selected by a panel of conservative activists. We will announce those panelists over the course of the next couple days. We are also reaching out to other organizations and websites who would be willing to share the videos with their audience and participate in this critical form of civic duty! To increase the number of people who participate in the political process constructively and instill the importance of citizen journalism by rewarding people with cash who show up and videotape an exchange between themselves and a member of congress during the summer recess. I think this is such a phenomenal idea that not only am I doing a post and encouraging people to chip in money to help fund the contest, I’m willing to help people who want to compete come up with questions and I’ll be happy to run some of the better ones on Right Wing News. If we were liberals, some rich guy like George Soros would just step in and fund this. However, since we’re conservatives, Dustin needs your assistance to help make this happen. If you think this is a good idea, contribute a few bucks and then kick back and enjoy watching Republicans in Congress sweat all summer as they’re peppered with the sort of questions you’d ask if you were there yourself.